Unfortunately, not every story I get to react to is some feel good story about someone overcoming cancer thanks to Rick Simpson Oil, or how anxiety was calmed down due to medical marijuana being the answer. Today I read a story on WebMd that was worth sharing for all of the loyal followers here as a caution of what can happen if you don’t educate yourself properly on using marijuana either medicinally or most likely, recreationally. I don’t want to sound like Debbie Downer here, because obviously this is a marijuana advocacy website and the entire staff here believes in it’s power and feel it has a lot to offer people with many different conditions. I also am fine with people smoking weed, because it’s much more safe having someone stoned than drunk, and you can buy liquor just about anywhere in the USA. So with that disclaimer firmly out there, it’s important that people do here about the potential dangers that are involved with CBD edibles. As the story published on WebMD started, a 70 year old man felt like he was “dying” as he got to a hospital via ambulance in Canada. The team at Dalhousie University in St. John, New Brunswick, Canada had confirmed that indeed the man had suffered a heart attack. What happened prior to the heart attack is what is the concern here. The man had a lollipop laced with marijuana. This was provided by a friend who felt that taking it would help the man sleep better. While they don’t know if this is what exactly caused the heart attack that day, (the person did have pre-existing heart disease), the statement by the hospital staffer rang loudly to me as I know many people who consume THC products and do not know what sort of dosage they need or can handle. There have been many experts who have stressed a concern over CBD edibles, which are sold in many shapes and forms. Gummies are the most popular edible, and I’m a very happy customer myself of CBD MD, and I find their gummies very beneficial to my health. You can also find brownies, snacks, and even drinks with CBD sold by many brands online and even more in the states who have recreational marijuana dispensaries. Also read: Marijuana laws by State. There are over 100 cannabinoids found in cannabis, and CBD is cannabidiol. There are many proven health benefits of CBD, and the edibles are derived from hemp or marijuana. The latter is only available in one of the states that has approved marijuana and made it legal. You’ll get THC in these products along with CBD. The problem with the edibles right now is that people are getting way too much THC. There is a lack of knowledge by novice users and the stats back up this statement. In Colorado, a legal state, more than 2,500 cannabis-related emergency room visits were checked by a research staff from 2012 to 2016. While there were more visits due to inhaled cannabis, the visits stemming from consumption of edibles were more prone to have cardiovascular and psychiatric problems. Another problem is the product labeling. This goes on in both hemp and marijuana CBD edibles, and consumers are very confused while reading labels. In a study done in 2015, an evaluation of 75 marijuana edibles found that only 17% were labeled accurately. We definitely need more governing in this industry on the marijuana (THC) level. Even with the aforementioned concerns, the market is a ripe one. In 2018, the market for cannabis edibles was a whopping $2.3 billion. This is according to Bethany Gomez, managing director of the Brightfield Group. It’ll blossom to $5.3 billion by the year 2022, according to the article. In just the hemp CBD edible market, the one I cover mainly, (and the stuff you can buy online), there was $100.2 million of business done in 2018 alone. That’ll boom to $4.9 million by the year 2022. The odd part, is in the FDA’s eyes, neither the marijuana edibles or the ones with hemp, are legal. The 2018 Farm Bill did bring hemp into a class of it’s own and become defined as cannabis with no more than 0.3% of THC. The biggest takeaway from this is that hemp was removed from the federal Controlled Substances act, where it didn’t belong to begin with. Still, the FDA has the position of not allowing food to have CBD or THC into interstate commerce, or to market them in any way as if they were a dietary supplement.This could all change, however, with groups being formed to look for ways that supplements or consumables with CBD could be legally marketed. I just wrote a piece on Martha Stewart’s involvement in this exact concept. There will be a hearing organized by the FDA on May 31 discussing this exact topic. Just recently, the FDA flexed their muscle by sending warning letters to three companies marketing CBD products for making unsubstantiated health claims. A host of states have outlawed CBD edibles, which sides with the FDA’s view. North Carolina was one of these states, going as far as sending letters to manufactures and retailers. Food establishments in New York have been warned that they can not add CBD to food or beverages. If they won’t follow suit by July 1, they risk losing the products. After October 1, violations and fines will ensue. There aren’t any universal tests in place for CBD edibles currently. The states that legalized marijuana for the most part have some sort of tests done for the marijuana products, according to Gomez. 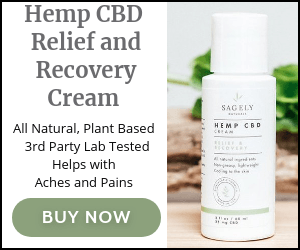 Many of the hemp CBD products that we have reviewed here have third party testing done, and the ones that show you their tests, are more recommended than others. Read our reviews and you’ll quickly find out which brands go the extra mile. Again, everything we review online, unless otherwise noted in BOLD, is derived from hemp and you don’t have to worry about the THC content. However, it’s important to know how to read labels because there are many products that can cause confusion. With all of this said, please feel free to reach out to me with any questions. I’m here to keep people informed and more importantly – SAFE.